Tell your doctor right away if you have any serious side effects, including: mental/mood changes (such as irritability, nervousness, anxiety, hallucinations), fast/irregular heartbeat, stomach/abdominal pain, difficulty urinating, vision changes, shaking (tremor), signs of your adrenal glands not working well (such as loss of appetite, unusual tiredness, weight loss). Dihydrocodeine is changed into a strong opioid drug (dihydromorphine) in your body. In some people, this change happens faster and more completely than usual, which increases the risk of very serious side effects. Get medical help right away if you notice any of the following: slow/shallow breathing, severe drowsiness/difficulty waking up, confusion. List Trezix side effects by likelihood and severity. Before using this medication, tell your doctor or pharmacist your medical history, especially of: brain disorders (such as head injury, tumor, seizures), breathing problems (such as asthma, sleep apnea, chronic obstructive pulmonary disease-COPD), gallbladder disease, heart problems (such as irregular heartbeat, recent heart attack), kidney disease, liver disease, mental/mood disorders (such as confusion, depression, thoughts of suicide), personal or family history of a substance use disorder (such as overuse of or addiction to drugs/alcohol), obesity, stomach/intestinal problems (such as blockage, constipation, diarrhea due to infection, paralytic ileus), disease of the pancreas (pancreatitis), difficulty urinating (such as due to enlarged prostate). 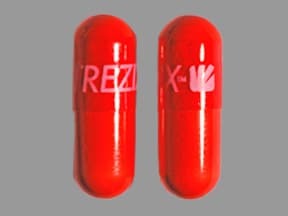 This medicine is a red, oblong, capsule imprinted with "TREZIX logo". Are you considering switching to Trezix? How long have you been taking Trezix?